MAKE: a modern print for our nursery décor. I think y’all know by now that I have a bit of a sparkle tooth. OK, it’s more than just a bit. I confess that I’ve covered my share of crafts and household items in rhinestones and glitter. So, when I knew was having a girl, it only seemed natural for me to bring a little sparkle to her room. 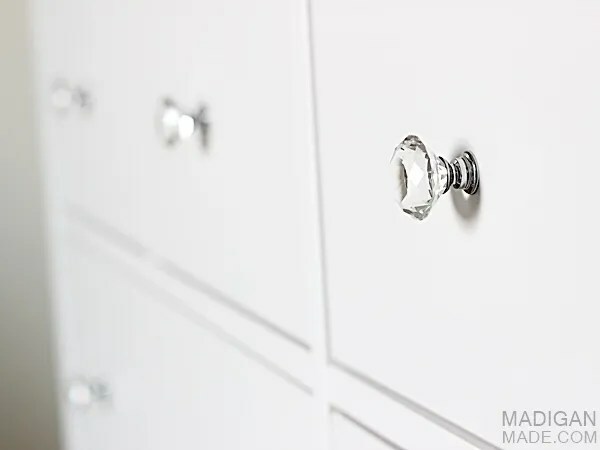 One of the first things I bought for the room were some cute crystal knobs for her dresser. Then, this past Mother’s Day, my parents were in town and my mom and I spent the day shopping. One of our stops was the Christmas Tree Shoppe since both of us had heard good things about the store but had never been to one. (Side note: We did not know what to expect, but did you know that The Christmas Tree Shoppe does not sell any Christmas items this time of year? Weird, right?) It’s a large discount store with anything from home décor goods to cereal (and lots of other random stuff!). While I was there, I found this big, over-sized diamond ring. I think it is actually is supposed to be a napkin ring? 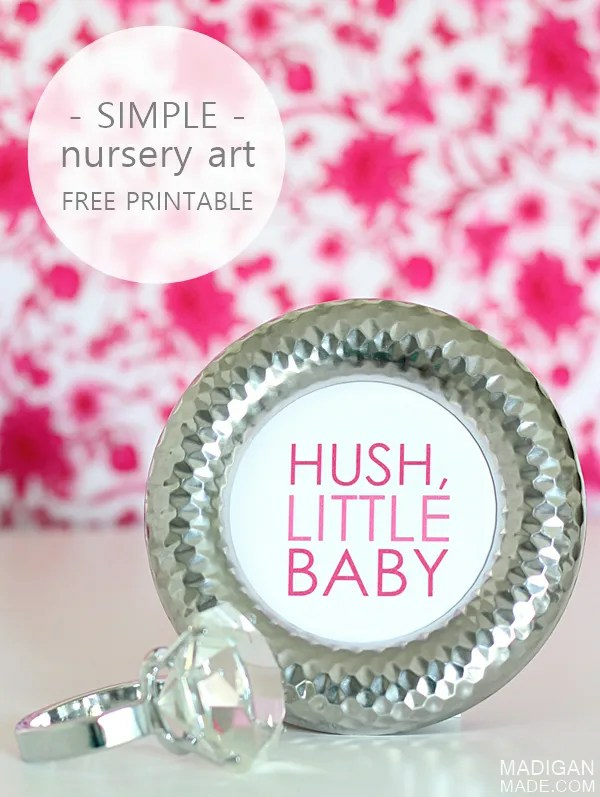 I looked at my mom when I saw it… She smiled when she saw it and I knew this little bauble needed to be in the nursery décor somehow. I created a simple print to compliment the ring in the room. Now, I can’t take credit for this printable idea. 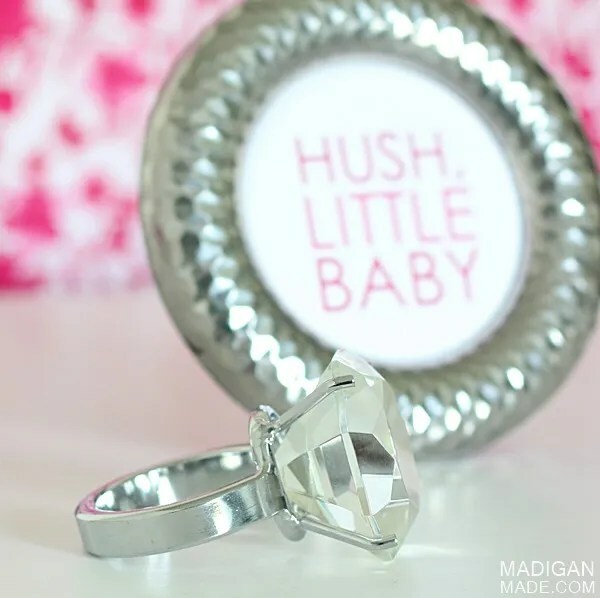 When I shared this picture above on Facebook and Instagram, Ginger, the blogger behind Literally Inspired, suggested that I set the oversized bauble next to something that said “Hush, little baby.” (You know, after the nursery rhyme?) Perfect! If you like the idea but wanted a different look or font to your sign, you could easily create your own print on cardstock in a word processing program using the same saying. But, if you like my version… I’m sharing it today for you use for your home décor projects! Just print it, pop it in an frame and you’ll have instant art for your nursery. I created the print in six different colors, in case you wanted a different look besides the pink color. Click HERE to download the print of your choice, or just click on the photo above. Please only use this print for personal use. 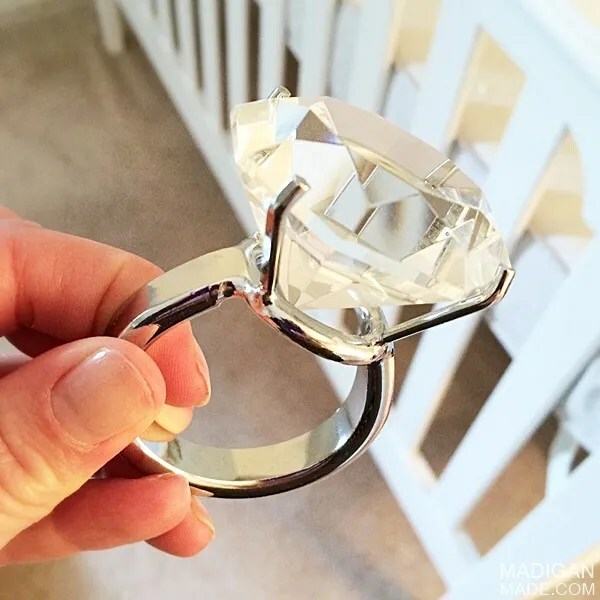 I plan to set the frame and big diamond ring on a shelf in the nursery. I love how the two pieces together are simple, sweet and oh so sparkly!